It was my second puncture halfway through the day and I had used up my spare tube. This came shortly after managing to find water at a creepy abandoned train station with rusty trams and cars scattered halphazardly around a derelict building with a caretaker who could not figure out how I got there. “You should get out of here, it’s dangerous”, he advised, while filling up my bottles from his own water supply. After walking a couple of miles under the scorching sun, I stuck out my hand and a battered, white transport van pulled up a few meters ahead. An old local from a nearby town and two Moroccans got out and invited me to squeeze my grubby self between the three of them in the front seat. Bumping sweaty elbows and shoulders, the four of us hurdled 30 km back in the direction I had just come. When we reached the town, they stopped in front of a car garage, closed for the customary Mediterranean siesta. “Do you know anywhere I can get something to eat while I wait?” I asked the old guy after he had dismissed the two workers for lunch. I had not yet eaten that day and was famished. “Nothing for miles”, was his answer. He then offered to drive me somewhere. I agreed on the condition that he join me. Leaving my bike, the Beast, at his nearby office and we jumped into his dusty, dented Panda parked outside. He shrugged. “Probably because of the job I do.” Which translated into the equivalent of a tax collector. “Well, one person’s devil is another’s angel,” I said. The taverna we pulled up to was one of those fabulous little local joints in the middle of Italy where you eat like a king and pay like a pauper. As we ate, he a pasta and me some chicken with wild vegetables, the sky grew dark and heavy with clouds. He dropped me back to the garage, where the mechanics had no clue what I meant when I tried explaining I was after a patch for my tube. The Moroccan driver opportunely turned up just then to once again save the day. “I have found a shop that sells bike tubes and tires. I can take you there if you want.” I jumped into his car at the same moment a deluge of rain, lightning and thunderclaps exploded overhead. Two new tubes and a tire later, the bulk of the storm had rolled over. I thanked the mechanics and my Moroccan angel, pulled on my rain jacket, wrapped a plastic bag around my saddlebag and headed out into the wet and wind. They watched me pedal away chuckling and shaking their heads in disbelief. I was most certainly the town’s dinner conversation that evening. 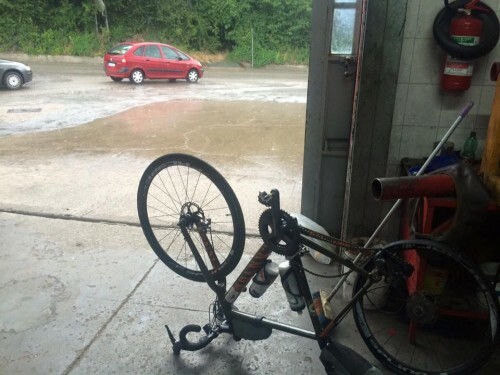 The last 60 km of the day was under rain and a second lightning storm which I tried and failed to outride. The bolts were striking rather close, but I was in the middle of open country, with nowhere to stop for shelter. There was nothing to do but pedal hard. The rain washed all the debree onto the side of the road, and the Beast’s back tire blew for the third and final time about 6 km from the next city. What else could possibly go wrong? It was only the second day on a 1,100 kilometer journey from my home in Positano on the west Italian coast, down to Battipaglia and over the Alpine mountain range in the Avellino region to the east coast. From there I would continue north, ending up in the Dolomites where I had volunteered to help man the checkpoint in Alleghe for the Transcontinental Race from Belgium to Turkey. A week in the mountains would be just what the doctor ordered. Recent news reports were a never ending stream of terrorist attacks, shootings, stabbings and random acts of violence. I was starting to feel the world had become a hard, hateful planet, that civilization and human goodness seemed to be taking two steps backward for every step forward. I set out on my bike journey in a dark mood. I would ride to escape from humanity, I had decided, but so far, my recent difficulties on the road were forcing me to interact with people at every turn. The next day’s ride continued to be eventful. Cycling up the east coast into a headwind was the least of my troubles. The back wheel deflated again just an hour after setting off. I had taken it to a bike mechanic the previous night after the third puncture, and asked him to change the rim lining in case that was part of the problem. He ended up making it part of the problem by doing such a bad job that the tube was rubbing the tape, giving it a slow leak. As changing the tube would not help and use up my spare for nothing, I rode 185 km on the same knicked tube, stopping every 10 km to re-inflate the tire. By the time I reached a good bike shop in Pescara, I was inflating every 2km. That day seemed to drag on forever. The mechanics in the Bevilacqua Sport shop grilled me about my journey, where I was going, where I had started. The owner laughed. “You’re going to Passo Giau in the Dolomites?” He asked. “I love it there. I rode it twice in the Giro d’Italia.” It turned out he was a former 6-time Giro d’Italia racer in his glory days. He knew what I needed and sorted the Beast out with new rims, tubes and tires for a minimal cost. “Have a fun ride.” He waved as I rode away, eager to get in a few more miles on my new tires before dinner. The morning of the fourth day, I passed another cyclist riding along the coast. At first he tried passing me, by speeding through a red light when I stopped. I caught up to him minutes later, and asked where he was headed. “Oh just riding around.” He said. He was in the area with his family on holiday, the in-laws included. “Ahah, you’ve taken off on a bit of an escape then.” I joked and he confessed that is exactly what he was doing. He joined me for around 20 kilometers, grilling me with the usual questions. Where was I going? Dolomites. Where had I started? Napoli. “Uhuh.” This was getting old. I fought the urge to roll my eyes and answered with the question I give anyone who ask me this.
. And naturally when anything involves danger, we are supposed to be afraid. “You’re right.” He agreed. He had to turn around to get back to the family for lunch, and offered me a cold drink at a bar we pulled up to, before parting company. “Good luck and safe travels.” He said pedaling back in the opposite direction. They were hot travels as it turned out, nearly 40 degrees celesius. I thought of all the riders racing the Transcontinental across Europe as we made our way from different directions to the same checkpoint, and hoped they were not suffering under the same heat. As I stopped to eat something that evening near Padua, I heard a commotion outside the bar. Three Africans and an unshaven straggly Italian were in some kind of struggle around my bicycle. It appeared the Africans had just stopped the bum from trying to steal my poor Beast. “What are you doing with that bike? That bike is not yours.” They were telling him. When the thief saw me approach, he let go of the handlebars and ran. “Thank you my friends.” I told the Beast’s rescuers. They just shrugged and laughed and I wondered if they were thinking the same thing I was, “And Italians call the immigrants thieves?” Once again I felt grateful for the kindness of strangers. 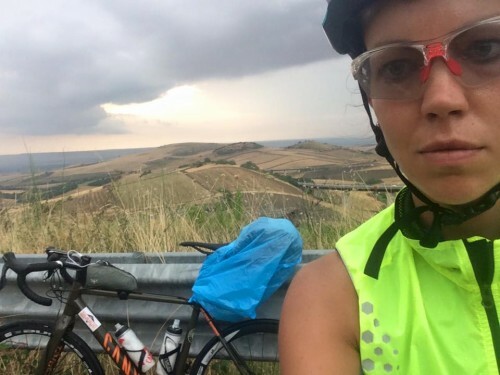 Throughout the entire ride, I had found only goodness and generosity everywhere, people who went out of their way to help whenever I needed assistance, eager to offer me a drink, a smile and a wave. I hoped I would be able to pass on a little of the same kindness to the Transcontinental racers as they passed through the checkpoint, hungry, exhausted and sleep-deprived. The words of a poem I had recently read, poignant and resonant, kept running through my head as I rode the last miles to Alleghe. Juju, your words are so beautiful and powerful. Thank you for this lovely story and all of the lessons ❤️ Life is more beautiful with you in the world. Just finished your book truly an enjoyable read! Nice going Cam. An important cause too. Hugs. Ahh I loved this and the poem too! Kindness is very important and humanity seems to be lacking as a whole these days. I think cycling alone sometimes give you insights into the better side of humanity that you may not otherwise get. A guy I met while cycling around como alone got chatting with me and bought me anespresso and a gelato in the time we were together and showed me some sights. Then we went our separate ways. Being treated kindly restores your faith in humanity and I think makes you a kinder person too for sure. Ps. Good you had your bike locked up! Love this piece, Juliana. I also love the poem, which I first heard being read by the author, Naomi Shihab Nye, on Krista Tippet’s ‘On Being’ – that marvellous radio program about all things artistic, creative, mindful, and generally wondrous. Have you listened to Krista Tippet? She would love having you on the show! Great storytelling from an inspiring athlete and a compassionate person. I wish you inflated tires and tailwinds for the rest of your journeys! So beautifully expressed! Such wonderful experiences! So glad you met such kind ‘roadangels’! Thanks for yet another totally inspiring story! I find it’s telling and deeply reassuring that you go into detail about the natural kindness of people, and only passingly remark on the would-be theft. That sort of priority is so reassuring! And you’re so right, where we meet one another in person, people just are this good. Love your spirit. I can’t wait to get your book this Christmas as a gift to self! Kind and good people is what I have found on my rides in Central and Western USA. Sure, an occasional bad egg, but very few. Sad truth is, the bad eggs usually get the headlines. Juliana – As a 64 year old man loving cycling but struggling with prostate problems keeping me off the bike for periods at a time your fight and endurance inspire me.